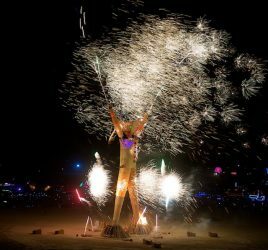 First time to Burning Man? If this is the first time you set out to Black Rock City and for some reason you have not been introduced to the newbie bible otherwise known as the First Timers Guide, here is your chance to get informed. Think about a situation where you were kicking yourself because if you had only listened before you set off, you could have done MUCH better. So finish the rest of this blog post (the Ten Principles of Burning Man showcased below are a good start), read the newbie bible and go to the Burning Man website and browse, it will do you well. For me the inclusiveness of Burning Man was felt right away. I arrived by plane to Reno and planned on figuring out a ride at the airport. It took me 5 minutes to find a ride full of amazing people to take me on to the playa. A new friend I made while shopping for last minute things, couldn’t have put it any better. 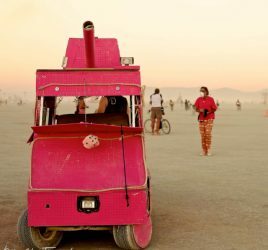 This community attitude is felt all over the playa and is one of the leading reasons so much cohesion and good is seen all over Burning Man. The elimination of money and the creation of a gifting community knocks down more societal walls than you could ever imagine. This is also the reason why if you are a newbie and something in your bible (First Timers Guide) was overlooked, no worries the playa is a very giving place. Remember that bible? (First Timers Guide) This is where that comes in. You are going to be in the middle of a desert, for a week (maybe less) and you have to not only survive but also thrive along with thousands of others. Each day not only will you need to do your basics (eat, sleep and drink) but you will want to be able to travel around the city (get a bike!) and take in all the art, music, talks, dancing, life, lust and ludicracy that is going on. This is your moment to shine. This is that moment for the accountant from Philly or the mother of four to take off those hindering societal shackles and be exactly who you are and always have been deep down inside. We want to see you, in all of your glory. It may take a village to raise a child, however it also takes a village to create a village. Everything you see in Burning Man was created by Burners. It is truly for the people by the people. Cooperation and collaboration is key to making this place as special as it is. It might be my environmental mentality off the playa however I gravitated towards this principle the most. MOOP (Matter out of place) is anything which is out on the playa that should not be. It’s easy to identify moop because most anything alien to the ancient lake bed (which is almost everything other than soft playa dust) should not be there. If you see it pick it up. If you drop it pick it up. Whatever you take out to Burning Man to live off of, you take with you and leave your camp ground as virginal as it was when you arrived. Oh if only the whole planet did this in the default world we would live in a very different world! Work hard, play hard. Live is about creating and enjoying. Work doesn’t have to be avoided if there is a sense of purpose involved. Trust me, you’ll find your purpose. Have you ever been 100% in the present? We know that our modern world presents many distractions however it isn’t until you truly rid yourself of them that you realize the difference. Don’t worry, you don’t need to try and be present and participate with the world around you, the playa has a way of making that happen all by itself.